A Journey Towards Hope continues through Nov. 18 at Haverford's Humanities and Multicultural Centers. The John B. Hurford '60 Humanities Center's current exhibit A Journey Towards Hope: Underground Railroad Sites in Oberlin, Ohio, a display of photography by Coriana Close, will remain on view through Sunday, November 18, 2007. 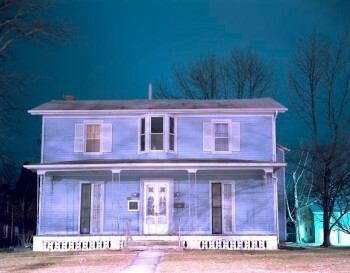 The images in the show include large-format color photographsâ€”many taken at night with long exposure timesâ€”of buildings in Oberlin that were essential to the abolitionist movement.“My photography is meant to serve not only as a document, but also as a reminder of what took place right here in Oberlin in the not so distant past,” says Coriana Close, who graduated from Oberlin College's fine arts program with honors in 2006.“In the darkness of slavery, Oberlin was a shining light, a candle in the distance symbolizing freedom.” A Journey Towards Hope has also appeared at Oberlin and Syracuse University. This exhibit is free and open to the public. A Journey Towards Hope is on display in Room 102 (Humanities Center) and 106 (Multicultural Center) in Stokes Hall, on the Haverford College campus. Stokes is located at the intersection of Walton and Carter Roads near the College Avenue entrance to the campus. The Humanities Center Gallery and the Multicultural Center are open Monday, Wednesday, and Friday 3-5 p.m., Tuesday and Thursday 4-5 p.m., and Saturday and Sunday 1-5 p.m.